Origin: Spazzychic was in town and we were trapped in L.A. traffic, discussing many things. Eventually, we got on to the subject of Krispy Kreme donuts. Both of us know people who have spent hours either in line or driving just for the glory of bringing a box into the office, people who rant about how inferior every other donut was and how Krispy Kreme is the only real donut. "But is it really worth it," we asked each other. Hours of your life gone, just to have a specific brand of donut? They were always good donuts, as far as we could recollect, but never anything special. But how to be sure? There was only one way. The Experiment: We determined to get a sampling of popular donut flavors from both Krispy Kreme and another popular donut chain, in this case Winchell's because it was handy and well-known. Then we got together two other people, Apostrophe, not a KK fan, and Rimshot, a big fan of KK donuts. The Price: For a dozen donuts at Krispy Kreme you pay $6.75. At Winchell's, you get 14 donuts for $5.99. Winchell's definitely had the early price edge. Also, the KK donuts are 85 cents a piece, if you're purchasing singly, whereas the Winchell's are 70 cents each. This was a real edge in the cinnamon roll competition, where even though Winchells cinnamon roll was WAY bigger, as you'll see later, they still charged 15 cents less than KK. Store Conditions: At Winchell's, it took a while to get the attention of the salesperson and it was pretty straightforward. At Krispy Kreme, we had a slight bizarreness with the change, but we were offered multiple free samples. 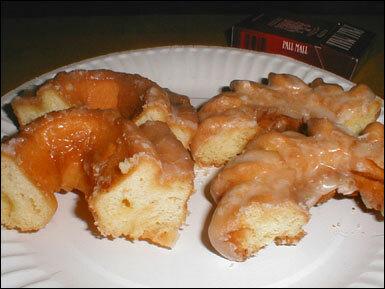 And donut quality aside, there is one thing that KK DEFINITELY has over Winchell's and that is the Fun Factor. They have the whole donut assembly line visible to ogle and ooh over. For more on that, click here. The Conditions: The four of us sat down at about midnight to taste test and visually inspect the donuts, and after Spazzychic had already had two donuts, which lead to the unfortunate incident of her losing it to a fit of giggles about halfway through the experiment. Remember Kids: Sugar and Late Hours Just Don't Mix! 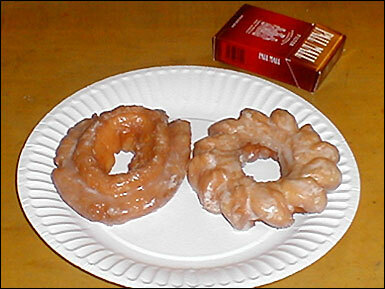 As you can see, the Winchells glazed donut is much larger than the Krispy Kreme donut, which actually costs more. Now Krispy Kreme's biggest claim to fame is their glazed and the fact that they are raised with yeast. 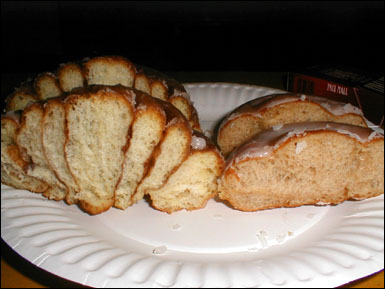 As you can see, BOTH donuts were actually raised with yeast, from the big holes in both of the side views. Notice, the Winchells holes are more evenly distributed and its overall got a more light and fluffy look to it. On the other hand, you can also tell from just looking that the Krispy Kreme donut has a much thicker glaze on it. Spazzychic Not so sweet, a little dryer, wicked fluffy, thinner glaze, not as "aiee messy" Flaky glaze, fluffy, weighs the same, though smaller. 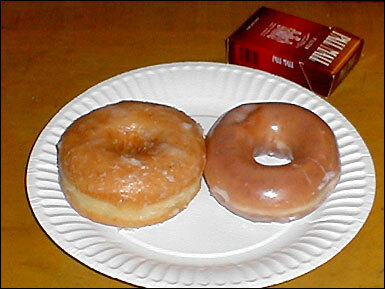 The overall vote after the tastings was with Fritters, Spazzychic and Rimshot having a definite preference for the Krispy Kreme glazed, with Apostrophe preferring the Winchells glazed. 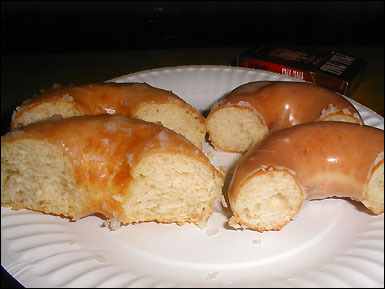 Once again, the Winchells donut is slightly larger, although the differrence in this type of donut wasn't as pronounced as the glazed. Also again, you can see the glaze is much thicker on the Krispy Kreme brand. This is probably due to the whole curtain of glaze these puppies pass through. Just from looking, it appears as though the Krispy Kreme is more dense. The overall vote after the tastings was with the girls, Fritters and Spazzychic, preferring the Winchells donut, and with the guys, Rimshot and Apostrophe abstaining and not really preferring one to the other at all. Here the size difference is screamingly obvious. 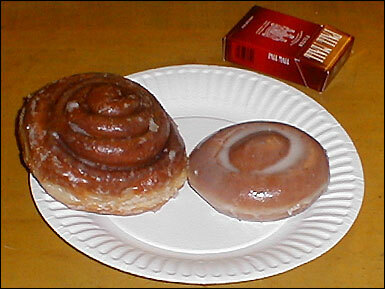 You would think with Winchells cinnamon roll being HUGE and traditional and the Krispy Kreme cinnamon roll being basically donut sized that Winchells would charge a special price for the cinnamon roll, but no, that huge monster on the left is still only 70 cents and 15 cents cheaper than that tiny thing on the right. Wow. Still, the Krispy Kreme is more obviously glazier, for the same reasons. Notice the Winchells cinnamon roll is actually rolled, and probably has cinnamon all the way through it, whereas the Krispy Kreme is just a donut made to look "rolly" with all the flavor outside. The overall vote after the tastings was with Apostrophe and Spazzychic preferring the Winchells cinnamon roll and with Fritters and Rimshot abstaining with no real preference. OVERALL CONCLUSIONS: Overall, the decisions were made that Krispy Kreme is more fun and overall better quality by a VERY small margin and Winchells was definitely cheaper. It was also agreed that yes, Krispy Kreme is worth going to if you like glazed donuts, their glazed donuts well deserve the reputation they have, but that that reputation does not carry over to the rest of the donuts. But overall, yes, Krispy Kreme is overrated and not worth going to extreme lengths to find. If you're a big glazed person or have kids with you who will not be Donut Connoisseurs and would enjoy seeing the machinery, Krispy Kreme is probably the best destination. If you're watching your money, go to Winchells, because the extra money at Krispy Kreme isn't worth it on most things unless you're getting mostly glazed. And please, don't drive an hour or wait an hour in line for Krispy Kreme. We also came to the conclusion that if you want to get your friends messed up without the use of alcohol or drugs, try this experiment yourself and shove lots of sugar down them late at night. It's a lot of fun.